3M Tegaderm Transparent Dressing covers and protects catheter sites and wounds. It helps to secure devices to skin and maintain a moist healing environment. 3M Tegaderm Dressing can be used as a primary or secondary dressing over acute wounds, surgical sites and chronic wounds. When To Use 3M Tegaderm Film Dressing? Tegaderm can be used to protect I.V. sites, enhance wound healing, prevent skin breakdown, and protect closed surgical incisions. 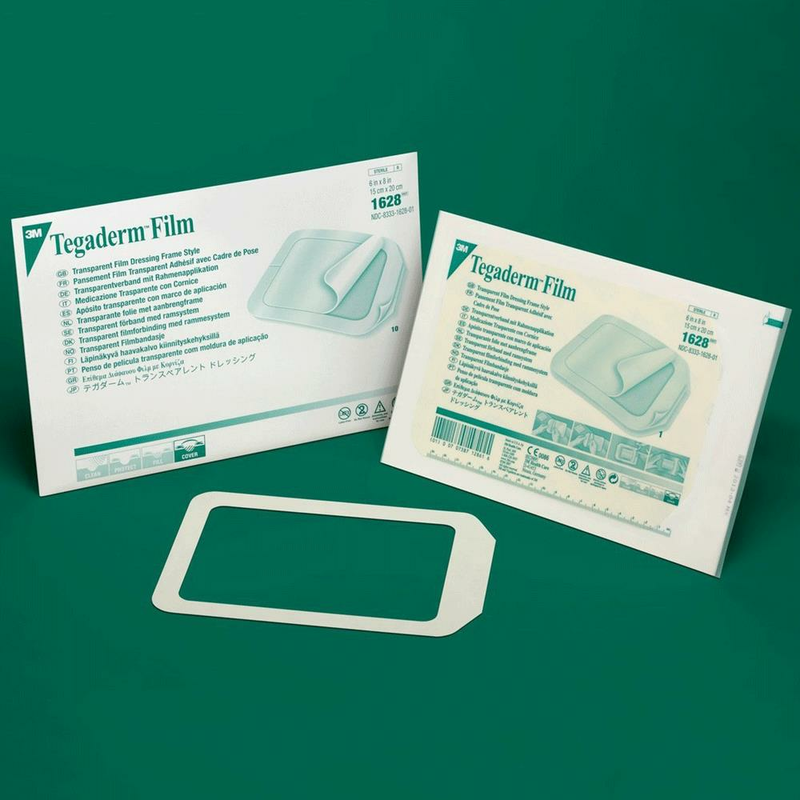 Tegaderm Film sizes, shapes and application styles meet a wide variety of needs. Frame style Window-in facilitates cutting to desired shape and size for specific applications when needed. Application of 3M Tegaderm transparent Film Dressing is intuitive and quick. It is especially convenient for patient self-care. It minimizes application time and saves dressing waste and costs. Frame delivery system provides maximum control of the thin film for rapid application. Frame style helps with secure and precise placement of the dressing. If the adhesive surface accidentally touches itself, the dressing can be separated and re-applied. 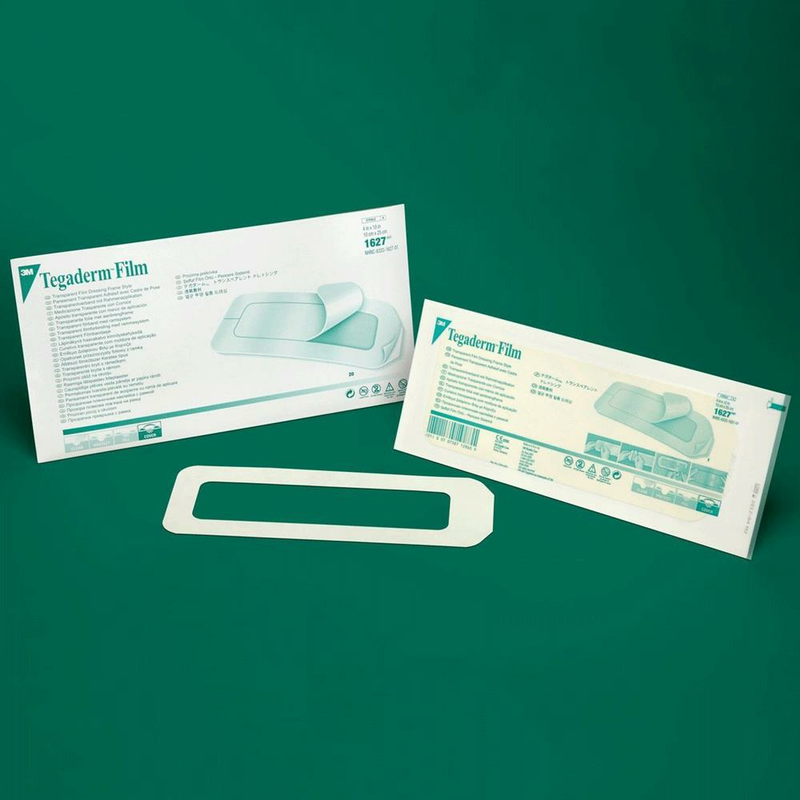 Tegaderm patches are constructed with a latex-free, hypoallergenic adhesive that is gentle on skin. It securely holds catheters and other devices in place. 3M Tegaderm film dressing provides good initial adhesion without building to excessive levels over time. The risk of patient discomfort and skin trauma is minimal even for dressings left in place for extended periods. The breathability of Tegaderm allows moisture vapor and gas exchange. It is necessary to maintain normal skin function under the dressing. Patients can wear 3M Tegaderm Dressings for a long span of time, with minimal risk of skin irritation. There will not be an excessive proliferation of skin flora. 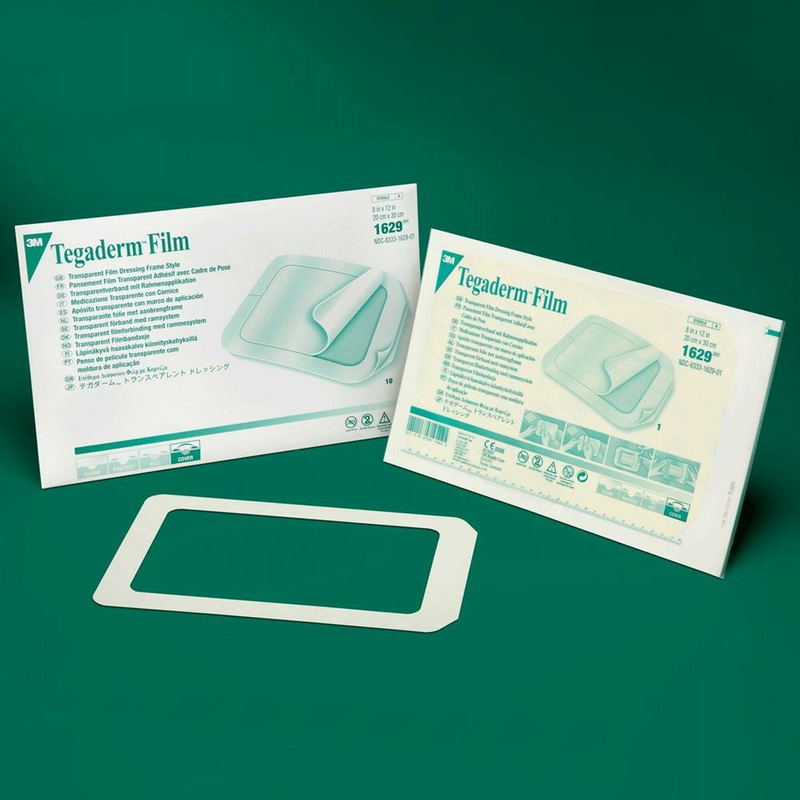 3M Tegaderm film dressing act as a barrier to protect the I.V. site or wound from external contaminants including liquids, bacteria and viruses. It is waterproof and patients can take bath, shower or swim with it. The dressing should be completely sealed around the catheter or wound. 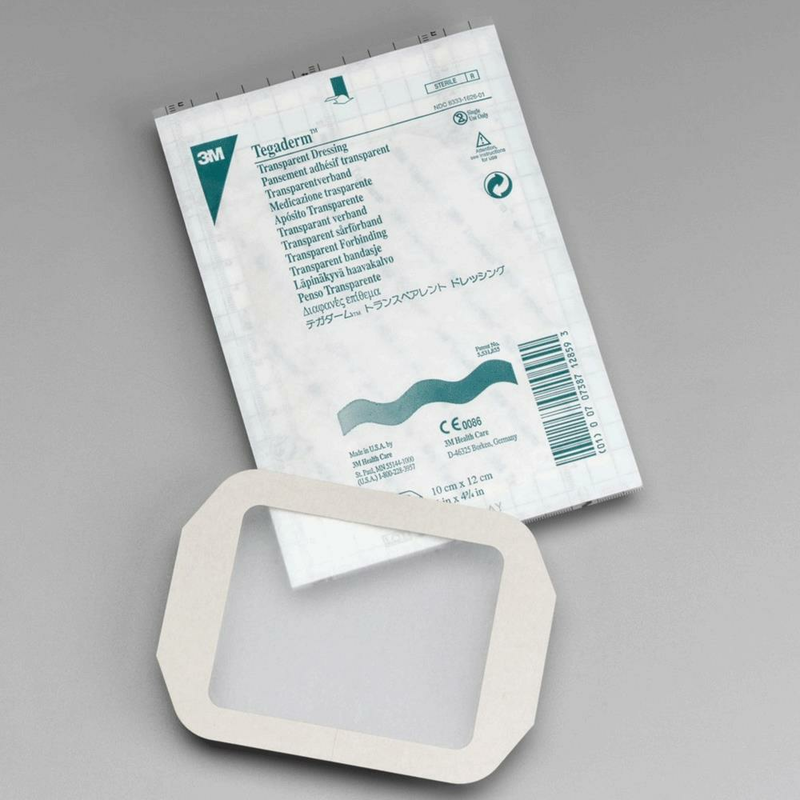 Tegaderm patches remain sterile as long as the outer package is intact. Do not resterilize by gamma, steam, or E-beam. 3M Tegaderm Transparent Film Dressing conforms to body contours. It stretches to prevent stress on the skin when the patient moves. It protects skin and bony prominences from abrasion and allows the patient to move easily. Tegaderm Transparent dressing is comfortable to wear and presents a flat profile. Natural wound fluid is sealed by Tegaderm to maintain a moist environment. Moist environment heals up the healing process. It prevents scab formation and dehydration of the wound bed. 3M Tegaderm transparent Film Dressing offers a wound environment that lets the epithelial cells to distribute across the wound surface. It reduces pain caused by wound dehydration and increases patient comfort. 3M Transparency Film provides complete visibility of the site during application. It also allows continuous monitoring of the target site without any need to remove the dressing. This visualization prevents unnecessary dressing changes and saves nursing time. With 3M Tegaderm Transparent Dressing, fewer dressing changes mean improved patient comfort. There is a reduction in the risk of skin trauma from repeated adhesive removal. For I.V. care, lesser dressing changes mean there in less catheter manipulation. Also, there is reduced exposure to potential outside contaminants. For wound applications, the longer wear time allows the wound to remain undisturbed. It prevents disruption of the healing process. The HICPAC/CDC Guideline supports longer wear times for transparent dressings than gauze and tape for I.V. applications. Less frequent dressing changes save supply costs and reduces nursing time. Numerous clinical trials by independent researchers support the use of 3M Tegaderm transparent dressings. They are ideal for both I.V. sites and wound care. Internationally recognized I.V. guidelines base site care recommendations on clinical studies using 3M Tegaderm Dressing. 3M Tegaderm film dressing is radiologically transparent. It is not necessary to remove the dressing from a patient prior to x-ray. How To Use Tegaderm Transparent Film Dressing? Select a Tegaderm dressing size that properly covers the catheter or wound site. Ensure at least a one-inch margin of dressing adheres to dry, healthy skin. Prepare the catheter insertion site or wound according to the approved protocol. To ensure good adhesion, clip excess hair where the 3M transparency film will be placed. Do not shave the skin because of the potential for micro-abrasions. Make sure skin is free of soaps, detergents, and lotions. Allow all preps and protectants to dry thoroughly before applying the dressing. Wet preps and soap residues can cause irritation if trapped under the dressing. Products with adhesive do not stick nicely to wet or oily surfaces. Do not stretch Tegaderm dressing during application. There can be mechanical trauma to the skin if you apply an adhesive product with tension. Stretching can also cause adhesion failure. The adhesive of 3M Tegaderm transparent dressing is pressure-sensitive. Always apply firm pressure to the dressing from the center towards edges to ensure the best adhesion. To customize a dressing for a specific need, use sterile scissors. Cut the dressing into desired size and shape before removing the printed liner. For best results and ease of application, cut the pieces so that a portion of the frame remains on at least two sides. Grasp one edge of the dressing and slowly peel it from the skin. It should be done in the direction of hair growth. Instead of pulling the dressing up from the skin, peel it back over itself. Grasp one edge and gently pull the dressing straight out to stretch and release adhesion. Apply an adhesive remover to the adhesive edge while gently peeling the dressing from the skin. To lift a dressing edge, put a piece of surgical tape to one dressing corner and rub firmly. To help you slowly peel back the dressing use the tape as a tab. 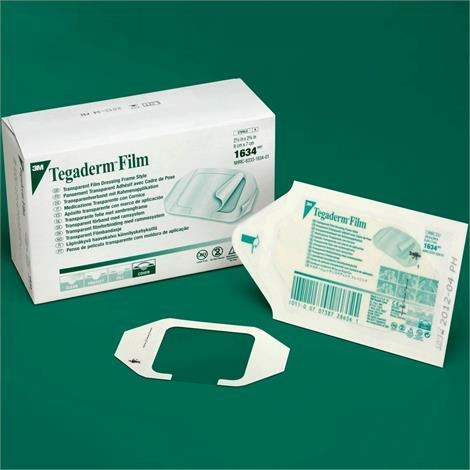 Do not use the 3M Tegaderm transparent dressing as a replacement for sutures and other primary wound closure methods. Do not stretch Tegaderm dressing while applying as tension can cause skin trauma. Make sure the skin is clean. It should be free of soap residue and lotion. Allow the skin to dry thoroughly before applying the dressing. This will prevent skin irritation and ensure good adhesion. Antimicrobial ointments containing polyethylene glycols can affect the strength of the 3M Tegaderm. Only under the care of a healthcare professional, the dressing may be used on an infected site. Tegaderm Transparent Dressings are not recommended to be re-sterilized. The code 1627 of 3M Tegaderm Transparent Dressing is 4" wide and 10" long.